10 Tips to Create your own Spanish Immersion Program for little $$ Dinero! Follow the tips you see here! They may seem small and simple, but they all add up and become powerful tools for helping you use/practice the Spanish you are learning ! Tip 1. Change your cell phone, computer and all electronic devices you use on a daily basis to Spanish! This is a great simple start! You may not know the meanings of the words you are hearing or reading on the screen; however, your eyes and brain have seen the same prompts in English over and over again hence giving you the advantage! Your brain will naturally use common sense and will be able to “guess” what the prompts are asking you and what the screen is telling you based on what you have experienced and seen before when they were in English! The things you pay for every month and your surroundings can become your immersion program! You have the power to change your surroundings to create that immersion effect! Make your surroundings your teacher! Tip 2. Pick Spanish when using an ATM! Remember you have used ATMs so many times that if you were to pick Japanese you would still be able to guess where the withdrawal button is, the deposit and the cancel buttons are etc. because in part you are using muscle memory and your brain is using memory from previous ATM visits to determine what the foreign words mean by remembering the English version of the same screen! Ex: It’s like putting your clothes in the washer machine; you just have to add detergent, click a button and bam! The machine starts washing your clothes. You just have to wait for the machine to complete its wash cycle. It would be silly to put the clothes in the washer machine and then start use your hands to stir the clothes in the machine! Completely unnecessary right? Because the washer machine does that for you! The same thing happens with learning a second language. Your brain will do about 30% of the work for you and the remaining 70% is done by conscious learning! You just need to follow these tips. You don’t need to know how they work or why they work—you just need to do them and I promise you will see results for free! Each person is different and has different “configurations” like a computer; however, on average almost all people do well! Tip 3. Program two Spanish radio stations into your car radio station selector and listen daily also download free podcasts in Spanish- pick topics that are of your interest! The best way to train your ear is to just listen to Spanish or to the foreign language you are learning! Just listen to the spoken language like you would music! Don’t try to understand what the words mean or what is being discussed! Your job is not to focus on the words but the sounds! There is something extremely powerful about just listening to the rhythm and “melody” of a language—since your brain can’t understand what these beautiful sounds mean yet, your brain starts to focus on their sounds. This is a natural process your brain goes through! Your brain then starts to sort out the sounds and rhythm of the language. Eventually your brain starts to notice a phonetic pattern, it starts recognizing familiar rhythmic patterns and identifying repetitive phonetic combinations. After approximately 2 weeks to 2 months of listening to Spanish, your brain will have successfully downloaded the phonetic structure! All of this without you even realizing it! You should listen to Spanish everyday for at least 2 hours. The more you listen the faster your brain will comprehend what the phonetic structure of Spanish is, thus helping you know what sounds like Spanish and what doesn’t. Use your daily commute as your mobile school! You are stuck in your car anyways, right? So, listen to your Spanish podcasts, radio stations etc…. Select Spanish audio for the program you want to watch. This is a very good exercise! I suggest you do this with a favorite program or movie you have seen many times because your brain will remember the English version of the program or movie thus helping you naturally understand what the Spanish version of the same program or movie is. This won’t happen overnight of course but it will happen! If you have direct tv or you can simply press the green button on your remote and bam! Your tv show is now in Spanish! Not all shows or channels are available in Spanish audio but quite a number of them are. Ex. One of my favorite shows “How I met your mother,” “Reba” and even “Frazier” are available in Spanish! 🙂 And yes, even though I am 36 years old, I sometimes like watching cartoons and I know I am not the only one :-). If you do and/or your kids do, then go to Cartoon network; they have Spanish audio on a lot of their cartoons! I watched “Popeye” the other day in the Cartoon Network channel in Spanish! Doing this will help you develop your ear and eventually some vocabulary as well! You can use your cable, dish or DVDs—don’t buy extra stuff! Most DVDs have Spanish language audio options and even subtitles but first use the Spanish audio option without the subtitles. Tip 6. Do your grocery shopping at a Spanish supermarket! You can try this one time just to experience it. I know usually people go to Publix or Kroger etc.. but try a Spanish shop! Google them, or visit my website and ask me what places you can go to in Georgia. I live in East Cobb Marietta so if you live somewhere else I may not have the 411 on the area but usually Google or any search engine can be of great assistance! These Spanish shops usually have bi-lingual cashiers etc… but mainly they speak Spanish and little English sometimes so it will force you to have to use the Spanish you do know to communicate! A lot of the items will sometimes be in Spanish, the fruits and vegetables, the directions etc… so this will be good for you to experience and see! Again, I can only speak for the places I know of here in Georgia, and I am not guaranteeing that you will find an all Spanish experience but at least it is an excellent option. Tip 7. Get a free Spanish newspaper at any Spanish store or supermarket, and compare it to an English newspaper covering the same news for the day! This is an excellent exercise! One of my favorites! I know, I am such a language nerd right? 🙂 Well, you can be one too! You don’t even have to buy the newspaper because a lot of Spanish stores carry free community newspapers or newsletters just like regular English speaking stores! You can go to your local Spanish shop (or google them) and visit the store, buy an empanada or two and get yourself a free publication! 🙂 read a little. Again, don’t stress out if you don’t get any or much of what is being discussed but rather enjoy the experience of reading it and comparing it—that’s it for now! You can also google known Spanish newspapers online and read the headlines for the day. First read the news in English and then read that same news article in the Spanish news paper and you will start identifying words and making educated guesses of what the words mean (and you can also use your Spanish/English dictionaries to reconfirm the meaning of a word). Tip 8. Go to Dance clubs and restaurants that have a Spanish night! Some of you may not be dancers, but come on! 🙂 At least try it once! 🙂 Have a mojito, relax and don’t take life too seriously! A lot of well known night clubs in Atlanta have Spanish nights and even other Counties and Cities! And guess what? Most of them give free salsa lessons!! Yes, free! 🙂 One of my favorite words! Typically from 9 to 10 p.m. most clubs offer free salsa lessons Ex. Sanctuary in Buckhead, Tongue & Groove in Buckhead, Loca Luna in Buckhead , Eclipse di Luna in Dunwoody, Atlanta & Buckhead etc.. to name a few! Most clubs seem to charge a cover; however, if you come before 9 p.m. or 8 p.m. (depends on the club), you get in for free—no cover! If you get there late, then yes, you have to pay sometimes $10 or even $20, which is ridiculous in my opinion! Havana Club in Buckhead likes charging $20 to get in; don’t know about now, they may have changed their fees—needless to say it’s not one of the places I typically like going to 🙂 but to be fair the few times I have gone, I had a blast. Google it and you will find places to go to! This is good because aside from learning a language you are experiencing the culture, you’re practicing your Spanish, you are meeting other Spanish speaking people or students etc.. TIP 9: Try out a Spanish meet up group in your area! Meetup.com is a place you can go to, if you want to find groups that share common interests. Put in your zip code and see if there are any meet up groups that get together to practice Spanish.. Some groups are good some are not; most of them are free so try it out. You will meet others and practice your español! Tip 10: Make your laptop, smart phone or tablet read to you in Spanish!! A talented young lady wanting to improve her Spanish skills! Learning Spanish on this Dad’s to do list for life and fun! A family of highly motivated students wanting to be multilingual! Be a part of our SIA Familia! 🙂 Each student has great reasons for wanting to learn español, what is yours? Kathy always wanted to learn a second language and El Señor y Señora Williams stay in Panama for 6 months every year! El Señor Martin used his Spanish to do El camino de Compostela in Spain! El Señor y Señora Collier love to travel and want to connect with the natives! El Señor Jelle is a brillian business professional that works with Mexican clients for his company. La Señora Theresa is a teacher that wants to connect with her student´s parents who only speak Spanish and also connect with her students. El Señor Steve, a business professional that wants to branch out! A mom and son powerful duo! Both want to learn Spanish to enhance their lives! El Señor Brian wants to help his Spanish speaking students and their parents in Alpharetta! La Señora Stephanie wants to learn Spanish to help her Spanish speaking patients in Cobb! Our beginner Spanish courses are the perfect introduction for the total beginner student and a great review for the more experienced beginner! The lessons are fun, empowering & strategically designed to help students easily overcome common obstacles faced when learning to speak Spanish! 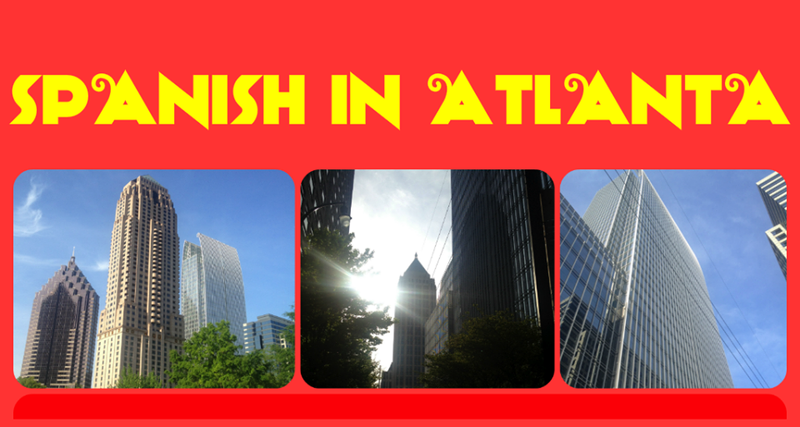 Spanish in Atlanta will teach you fun, practical priority material needed for every day life! Each lesson is carefully created to ensure class interaction so no student will just be sitting there taking notes! Speaking a foreign language is a sport that requires physical practice and human interaction! The 6 student max. per class ensures that each student gets personalized attention and the opportunity to practice all the material that is learned in class! Lessons are delivered with passion, creativity and enthusiasm! We are thrilled to try this out and connect with all of you passionate about learning, especially foreign language learning! and everything you could possibly need to know about Spanish in Atlanta! Contact us directly 678-517-9715! We are ready and happy to assist you Sun-Wed 9am-8pm!